Remove all the IFS brackets, being careful around the motor mounts, as they will likely need reinforcement. Assemble the supplied jig, bolting it together with the ¼” bolts. When assembled, the 18mm holes, center to center is 43.5”. The “hook” end of the jig is used at the rear, to get around the body mount. 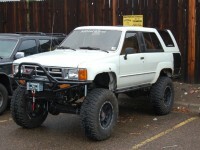 Attach the Front Range Off-Road Fabrication front hangers. 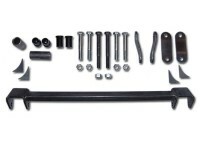 To duplicate factory straight axle setups, simply line up the 1×2 tube with the front Crossmember, with the hangers toward the rear of the vehicle. Make sure the hangers are centered by measuring each side carefully, and at the same points. Tack weld the hangers on. Find the location on the frame for the shackle sleeve. To duplicate factory straight axle frame dimensions, you’ll need to find this location: 43.5” from center of front hanger hole, to center of shackle hole. This needs to be 1.5” from the bottom edge of the frame. Use the supplied jig to accurately locate where this hole needs to be relative to the front hanger. Once the shackle hole is located, drill through both sides of the frame rails with a 1 5/8” hole saw. Be very careful drilling this hole, to make sure it is parallel with the front hanger. Again, use the shackle jig to locate your sleeves before welding. Bolt the front end of the jig to the outside of the hangers. The second piece of the jig should make a “jog” to the outside of the frame, to help compensate for the extra width of the sleeve. Slide one bushing into the outer end of the sleeve, and pin it to the jig. It will help to grease inside and outside of the bushings for removing them before final welding. To double check, in front of the sleeve, from the outside of the frame to the end of the sleeve, should be 1”. Now, you’ll need to measure the center of the shackle bolt head, to the bottom of the frame, should be 1.5”. Check that the sleeve is parallel with the front hangers and tack the washers to the frame. Double check the sleeve location, an tack the sleeve to the washers. Repeat this process on the other side, then check the distance between the sleeves. Make sure to flip the end of the jig around to face the outside again. The distance between the 2 inner edges of the sleeves should be approximately 25 3/8”. Now weld all around the rings and sleeves, inside and outside of the frame. Attach the gussets to the front hangers, and you can now weld on the front hangers as well. One gusset should be at the very front of the hanger, the other very close to the rear of the hanger. You should weld all surfaces to firmly attach the hangers, then stitch the 1×2 tube to the front Crossmember with at least 3 welds 2” long on the front and back side. Let all the welds cool, then wire brush all welds, primer, and paint. Note: For those who wish to weld on hangers and sleeves before cutting the IFS brackets off, you will notice the jig has to be slid between the A-arms. Usually it will clear, however, some vehicles may require unbolting the bottom of the shock for easier use.